This story was awesome. I do not know why I waited so long to read it, but better late than never. This is my first time reading Jennifer Estep and it will definitely not be my last. I enjoyed every moment of this story; there was never a dull moment. This is a story that is best going into blind, as the experience will be better. The vivid descriptions and the world building enhanced my enjoyment of the story. I felt I was a part of this world steeped in magic and gladiator fights. Character development was on point. I met characters whom I loved and then there were those whom I passionately disliked. Evie, the main character proved a force to reckon with. She showed remarkable growth throughout the story. She started out meek and mild like a little lamb but by the end of the story she was like a roaring lion. I loved how she stood up for herself and others and in the process discovered true friendship. The secondary characters fascinated me. There was the dance instructor, the jewelry maker and the members of the gladiator troupe. They brought their own blend of flavour, which included humour, secrets, danger and romance. I loved the pacing, which had me on the edge of my seat. I kept wondering what next would transpire. Intense action scenes and battles to the death added to the darkness and grittiness of the story. The story wrapped up nicely. No cliffhangers, but based on the ending we know there‘s more in store for Evie and her friends. I cannot wait to know what next the series has to offer. 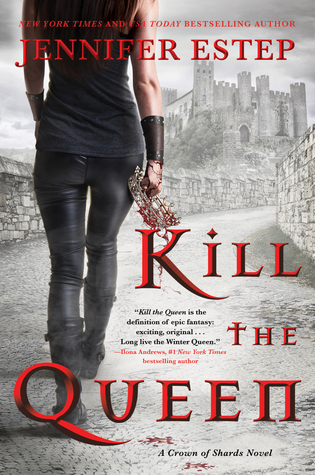 Fans of fantasy will enjoy this offering from Jennifer Estep. Action packed with interesting characters, this story is not to be missed.